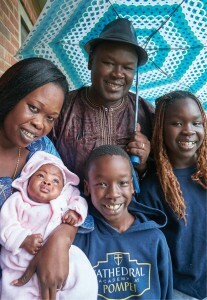 The Ayeil Family: Mom, Adit Meukuir, and baby Nafoni; Dad, Bang Ayeil; Naywel Ayeil, right; and Deng Ayeil, bottom center. Naywel Ayeil says the most important lesson she’s learned at Cathedral Academy at Pompei (CAP) in Syracuse is the Golden Rule. “It’s treating others the way you want to be treated,” the fifth grader said at her Syracuse home. That’s just the kind of lesson Naywel’s father, Bang, and mother, Adit Meukuir, hoped their children would learn when they chose a Catholic education at CAP for Naywel and her younger brother, third grader Deng. “Back home, we went to Catholic schools, so it was important for our kids to,” Adit said. Bang and Adit are originally from South Sudan. “We abandoned our country because of the war,” Bang said, recalling the nearly two-decade civil war that left millions of Sudanese dead or displaced. Both Bang and Adit sought refuge in Egypt, where they met and married in 2001. The couple was resettled in Syracuse in 2004, joining Bang’s sister in the city. It was difficult moving around and ultimately leaving family and friends in Sudan behind. “But the U.S. is home. America is home. We have been welcomed. Our American friends opened their doors and schools and churches to us,” Bang said. Naywel was born not long after the Ayeils came to Syracuse. When it was time for her to go to school, Bang and Adit said their relatives and friends encouraged them to choose a Catholic school. CAP is located on Syracuse’s North side, an area that has been home to newcomers for generations. Today, about 40 percent of CAP’s student body come from refugee families; another 26 percent come from immigrant families. Students trace their roots to Ghana, Haiti, Laos, Liberia, Puerto Rico, Sudan, Tanzania, the U.S. and Vietnam. The diversity of the student body “represents the world we’re in,” said CAP Principal Sr. Helen Ann Charlebois, IHM. “If we can get the kids to get along with each other in this school building, the rest of the world should be able to get along, too.” She tells the children that CAP is a “peace site” and encourages them to take peace out from the school and into the community and world. Both Naywel and Deng have made good friends in the school and share a love of gym class. Reading is another of Deng’s favorite subjects, especially the Black Lagoon series. Naywel also loves science, particularly the experiments, like the one that involved dissolving gummy bears in vinegar. She said she wants to be a veterinarian or doctor when she grows up. Bang and Adit want that for her, too. Their dreams for their children are Catholic high school, then college, where they can get a good education and earn their degrees. The Ayeils are working hard to give their children those opportunities. Adit works at Syracuse University. Bang worked at St. Joseph’s Hospital Health Center before enrolling at Onondaga Community College, graduating with an associate’s degree in business administration last year. He plans to begin work on his bachelor’s degree at Syracuse University this spring. He also works as the youth minister at St. Vincent’s Church in Syracuse. 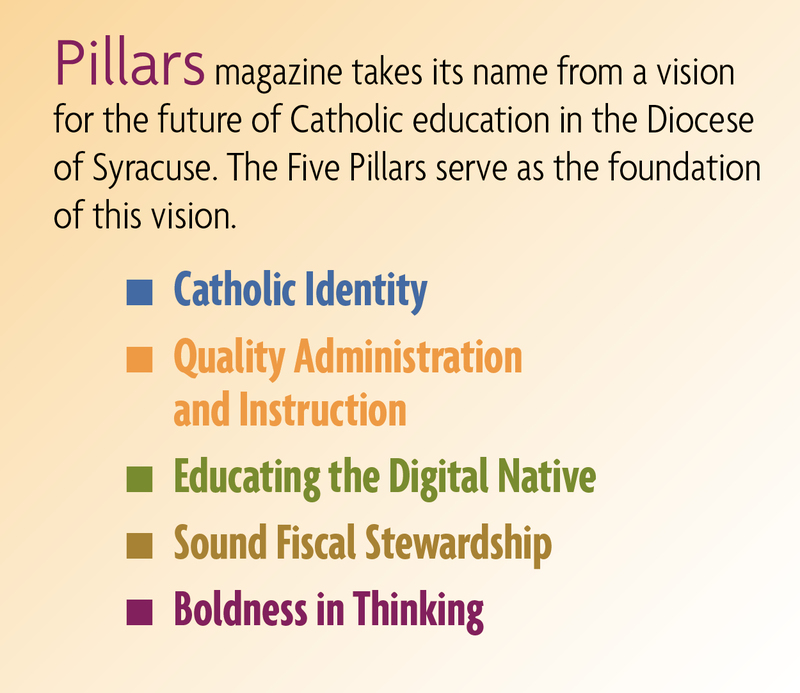 And, like many other families at CAP, the Ayeils sacrifice to be able to provide their children with a Catholic education.